I love french toast. Like, really, really love it. But sometimes the whole sliced bread and egg custard thing can get a bit boring. Recently I’ve been buying Mexican baguettes called “Bolillos” which are basically demi French baguettes, only Mexican, and figured I’d try making french toast with them. Rather than cutting the bread in long slices, I sliced them into thick medallions. I figured the thick slices would produce a crispy top and bottom and silky soft custard center. To change it up even more, I made a simple blueberry compote to top it all off! French toast medallions in second part of post..
Slice baguettes into 2 inch slices. Day-old bread works best…the drier the better. Mix remaining ingredients in a large bowl. Add bread medallions to egg custard and let soak for 10 minutes. Make sure to flip the medallions half way through the soaking time. Once soaked, carefully fry medallions in a bit of butter. I use a really hot cast iron skillet with 1 tablespoon of butter. Brown on both sides and serve immediately. Place all ingredients in a small saucepan. Heat over medium heat for five minutes. 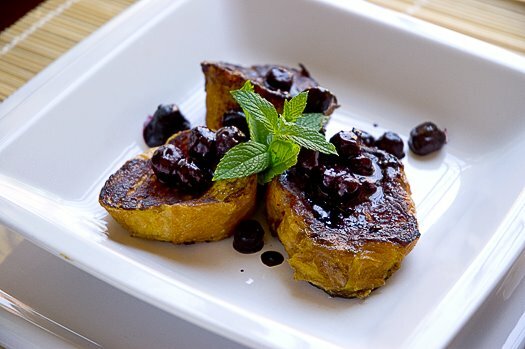 I made a similar french toast recently, but I used blackberries and agave to make the compote. Did you eat it with the mint, or just use it for garnish? I bet the freshness from the mint would be great with the toast. Every once in a while I make French toast from a bread called Ruissian Easter Bread from Acme baking here in SF. It's a can-shaped brioche loaf with candid citrus and currants and such. Yummy! The mint was just for garnish Allison, but you're right, it would add a nice dimension. Paul, that sounds wonderful…I love brioche based french toast!